I knew when I first met Andrew Neu that someday I’d be writing about him. I found him to be such an interesting and versatile musician. The first thing that struck me about him was the level of his skill in playing. Next was the very down to earth personality, those blond curls and that ready smile. With so many talented saxophone players already in my CD player, I wondered how I could fit yet another one into my mixed bag of musical favorites. I didn’t know how there could be anything truly new, because I’ve heard so, so many good players over so many years. And that’s only because I live in Reading, Pennsylvania, home of the Berks Jazz Festival; I’m blessed with the opportunity to get a close-up look and impression of the great players that come through our town. And that includes saxophonists like David Sanborn, Boney James, Richard Elliot, Kim Waters, Warren Hill, Euge Groove, Kenny Blake, Gerald Albright, David Mann, Kirk Whalum, Dave Koz, and the list could go on. But I didn’t need to worry. Just as with other artists who are true to themselves, I found that in Andrew Neu there was, indeed, something new. I had heard Neu with other players, mostly as a sideman and recognized that he was very talented. I’d seen him lead a high school jazz band and knew he was not just a player, but an effective leader, conductor, composer and arranger and that his talents were many. But when I heard him do his own show back in 2011, I was more impressed than I ever could have imagined. I loved the tunes, I couldn’t believe how he kept going and going with one exceptional performance after another on each song. He had a passion I loved to watch, and while he’s aware of his audience, he was mostly lost in each moment of musical expression – totally engrossed in a perfect delivery of what he came here to do. I was, and still am, so impressed – after hearing him perform numerous times, now, I see the same signature of dedicated effort and perfection in performance. Neu has so many things going on I can hardly keep up. Here is an encapsulated view of just some major highlights of his career: he was chosen to play and tour with Bobby Caldwell and also with Diane Schuur in major US cities like Boston, New York, Los Angeles and Las Vegas, as well as Japan and China this past year; he has been regularly filling in with Smokey Robinson on his tours. He’s also played in England, France and Italy (the Italy trip involved taking a high school band there to perform). He plays with Peter Nero and the Philly Pops, and has played with the Philadelphia Orchestra. He leads an all-star big band with trumpeter Anthony Bonsara in Los Angeles, and has shared the stage with Elton John, Patti LaBelle, Melissa Manchester, Mel Torme, along with many contemporary jazz artists, such as Pat Martino, Randy Brecker, Rick Braun, Richard Elliot, Gerald Albright, Kim Waters, Nick Colionne, David Benoit, Chieli Minucci, and Brian Simpson. He recorded with Bobby Caldwell and others, including Manhattan Transfer, David Sanborn, Jeff Lorber, Brian Culbertson, Sister Sledge and Buddy DeFranco. One thing is certain about Neu. He is constantly changing from one location to another. You may find him in the Catalina Jazz Club in Hollywood, California or the Razz Room at the Hotel Nikko in San Francisco, playing with Bobby Caldwell or Diane Schuur, or you might find him in Pennsylvania for most of the ten days of music of the Berks Jazz Fest, which is where I’ve found him in recent years. I might add there are a few regulars who are always part of Berks -- people like Gerald Veasley, Chuck Loeb and a few others with a versatility and talent for orchestrating and arranging music for events involving many musicians. Andrew Neu is quickly becoming one of those who are valuable to Berks in that regard -- he simply has that much to offer. I’ve seen it first-hand and I’ve seen his fan base continue to grow, something that is exciting to watch. I wanted to learn more about how Neu began playing the saxophone in his early years and get to know the visions that have provided him the energy to accomplish all that he does. What has and does life as a musician mean to him as a person? Interestingly, Neu began his musical efforts with a clarinet. He loved trumpet, but an older brother was already busy learning to play it, flute was taken by a sister, and drums were too loud for the household, so he settled on the clarinet. Later, he realized this had been a good choice, because it was much easier to go from clarinet to saxophone than vice versa. And when he switched to the saxophone, he always had the clarinet to fall back on. Along the way he learned to play the flute, also, and he has never fallen out of love with the trumpet. Seeing his brother play gigs made him realize this is something he also wanted to do some day. He got into the high school jazz band. He spent a lot of time listening to classical music in his earlier years and this gave him an enduring appreciation at a young age for the teamwork of more than one instrument – a ‘big band.’ He loved the idea, and it shows that in so many of his efforts; it’s leading or playing in a big band that seems to satisfies something deep within him. Neu likes to play all kinds of music – he’s happy with a big band, a folk band, playing behind a vocalist, enjoying the quietness of an acoustic song, or a loud ‘kicking out all the stops’ type of song, in addition to Latin, funk, and classical. He writes and transcribes music for entire bands for Kendor Music, and for the individual music of particular artists. Neu learned early in his career to always give his best effort, and that he won’t always know who might be listening and what they are looking for. Bringing your top game every time and appreciating all of the opportunities that come your way has been an important part of his vision of what being a musician is about. It’s also important to him to be emotionally open to music and where it takes him and where it takes others who are listening. Neu is grateful to have played on the albums of three key players in the last year, being featured on Steve Oliver’s top 10 record, World Citizen, Bobby Caldwell’s new CD entitled, House of Cards, and playing sax and flute on every track of Peter White’s new CD, Here We Go. Neu has released three well received CD’s of his own (Inspire, 2000, In Clear View in 2007 and Try Something Neu in 2009) and is now ready to launch his fourth and most exciting CD on June 4th of this year. 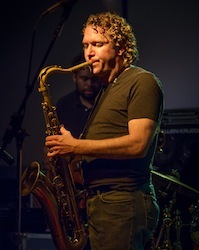 The new CD title, Everything Happens for a Reason, was inspired by his recent experience of looking forward to a gig in Bermuda or the Bahamas. While planning the trip, Neu realized Berks Jazz Fest was at the exact same time, and felt he needed to choose Berks instead of going to an island. As hard as that was, it turned out to be a great choice because that year many got to know him, and many opportunities grew from that particular year being part of the Berks Jazz Scene. He knew afterwards there was a reason why he didn’t end up on an idyllic beach during that ten day period. Since that time, he’s been reminded so often that it’s true – things really do happen for a reason. The new CD is being produced by Brian Bromberg (who played on and helped engineer In Clear View) and Steve Oliver. Neu says, “It’s an adventurous project featuring Rick Braun, Bobby Caldwell, Jeff Lorber, Brian Bromberg, Steve Oliver, Tom Schuman, Alex Acuna and others. It’s embellished by a horn section and a full orchestra and takes you on a journey.” Andrew co-wrote a song with Bobby Caldwell for the CD and arranged a different take on the well-known jazz standard, ‘Take Five.’ Neu says it’s inspired by the soul jazz and Latin music of the 60’s. The CD will also feature more of Neu’s flute playing. As an observer of his brilliant career, I can only say: it definitely shows. And becomes Neu every day.